Data show Halloween is one of the worst days of the year for homeowners and auto claims related to theft and vandalism. Deductibles and policy gaps could leave you on the hook for hundreds of dollars in damages. Homeowners should also review liability coverage related to dog bites and other injuries trick-or-treaters might sustain on your property. 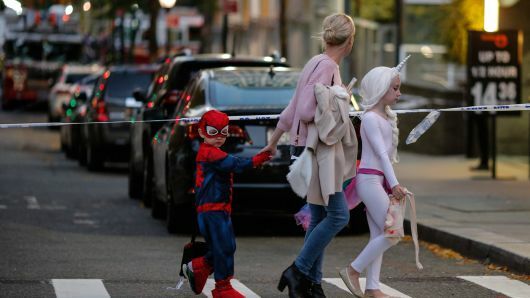 Kids in Halloween Customs cross the street near the scene where a man driving a rental truck struck and killed eight people on a jogging and bike path in Lower Manhattan on October 31, 2017 in New York City. “Some of them are eager to greet all the trick-or-treaters, but some get scared,” she said.